So NFL Films has its own movie studio. So here is “Super Bowl LI: The Greatest Comeback in Super Bowl History”. 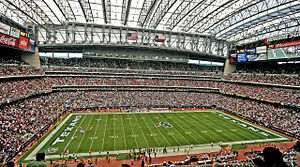 The game was played in NRG Stadium in Houston Feb. 5, 2017 (shortly after Trump’s inauguration) for the 2016 NFL championship. The New England Patriots fell the behind the Atlanta Falcons 28-3 and wound up winning 34-28, after 8 minutes of the 3rd quarter, in OT. The 39 year old Tom Brady led the rally, and there were two controversial catches in the game. Brian Resnick explains what a lifetime of playing football does to the human brain. Donald Trump doesn’t want his youngest son to play (Face the Nation) . Wikipedia attribution link for stadium picture by eschipur from Flickr, under CCSA 2.0.